The facade of the Town Hall in Freising, Bavaria in Germany, is backed by the 17th century bell tower of Saint Georges Church. 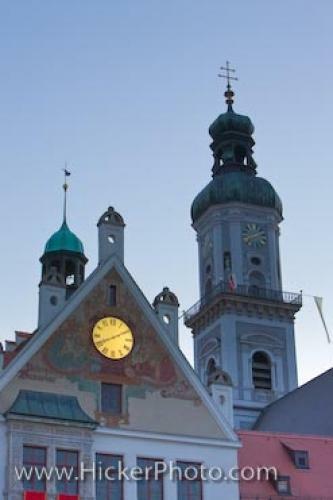 The muted colours of the facade on the town hall in Freising, Bavaria in Germany and the soft pink of the roof, makes the lighted clock face more noticeable in the Marienplatz (Saint Mary's Place) of this ancient Bavarian town. The 17th century bell tower and the 15th century steeples of Saint George's Parish Church, behind the Rathaus (Town Hall), complete a peaceful, timeless scene.The church was built in 1440 by an architect who was not very well known, and both these historic buildings tower over the older parts of Fresing. This view of both the Town Hall and the bell tower of St. George's Church was taken from along the main street of Freising.Facade of the Freising Rathaus (Town Hall) and bell tower of St George's Church in the Marienplatz seen from along Untere Hauptstrasse, City of Freising, Bavaria, Germany, Europe. bell tower in Freising, Bavaria in Germany.